Purchasing a used truck allows you to save big, and because of those savings you'll have money left over to purchase a couple accessories. A few of these accessories are decorative, while others add to the function of your used automobile. Although pickup trucks have a great deal of storage space outside of the cab, they don't often have much inside the cab. Dash pads work great, as they stick to giant unused dashboard and allow you to place your cell phone, house keys, or pen right on top. Most have a gel surface that your items will adhere to without making them feel sticky to the touch. Adding a grill guard to the front of your truck will serve several purposes. It will keep your truck safe from roaming cattle if you live in a farm area, as well as from small fender benders in a parking lot. Also, the grill will have a place to attach more lighting for better nighttime viewing. Do you often have paperwork to fill out in your used truck while out on a job? 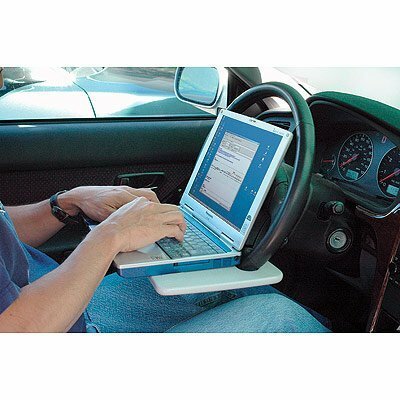 If so, the steering wheel desk is a must-have accessory. It takes just seconds to snap it into place. You can also use this handy device during your lunch break, as many brands even have a built-in cup holder. Forget the hanging air fresheners of old and pick up a air ionizer that purifies the air and refreshes it. This is a great accessory for anyone who has allergies or lung ailments, such as COPD. Of course, it works perfectly for all individuals who appreciate taking a stinky vehicle and turning it into a vehicle that smells like it's brand new. Chances are that if you need a used truck, you have equipment to haul around. A folding ramp is easy to install, no matter what make and model truck you bought, and it allows for quickly loading and unloading things like lawnmowers, table saws, or pieces of wood. You can even use the folding ramp to help a friend move furniture from their old apartment to their new home in your spare time. With the above items you'll turn your used automobile into a vehicle you can be proud to own and operate. It will function better, look better, and even smell better too.